Zwelinzima Vavi is General Secretary of Congress of South African Trade Unions (COSATU), and Vice-Chairperson of the Millennium Labour Council . Vavi was born on a farm in Hanover, Northern Cape, with a mineworker father and four brothers, seven sisters. He does not know his birth-date. He was a child labourer, looking for work among neighbouring farms. In 1987 Vavi worked in a gold-mining territory of Klerksdorp and Orkney. He was a uranium plant clerk at Vaal Reefs mine, and joined the National Union of Mineworkers (NUM) as an organizer. He was fired from AngloGold in 1987 following a massive miners’ strike which crippled the Chamber of Mines. He then joined Cosatu as a volunteer. In 1988, he became COSATU’s regional secretary for the Western Transvaal. In 1992 he took up the position of National Organizing Secretary. 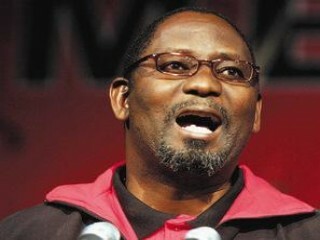 he served as COSATU’s Deputy General Secretary from 1993 to 1999. Vavi took centre stage in the four-month negotiation that preceded the the 1997 Jobs Summit. He serves on the International Labour Organisation’s (ILO) commission on globalisation. In 1999 he succeeded Mbhazima Shilowa (now Gauteng Premier) as general secretary of Cosatu. As General Secretary he has expressed disappointment with political progress in Zimbabwe, blaming mismanagement by government, an ill-conceived structural adjustment programme, and factors beyond its control like sanctions against neighbouring South Africa during apartheid years. He addressed the 27 June, 2002 XIV International AIDS Conference where he pushed mass education and prevention campaigns. Talking of the alliance which governs South Africa between the African National Congress (ANC), COSATU and the South African Communist Party (SACP) after a failed trip to see the Zimbabwe Congress of Trade Unions (ZCTU) in 2004, he is critical of the ANCs approach to Zimbabwe, privatisation, and corruption in government. He took particular issue with Public Investment Commissioners (PIC) Telkom share purchase, involving former communications director-general Andile Ngcaba and head of the presidency Smuts Ngonyama . He is married to Nikiwe, a PA with the Gender Commission.